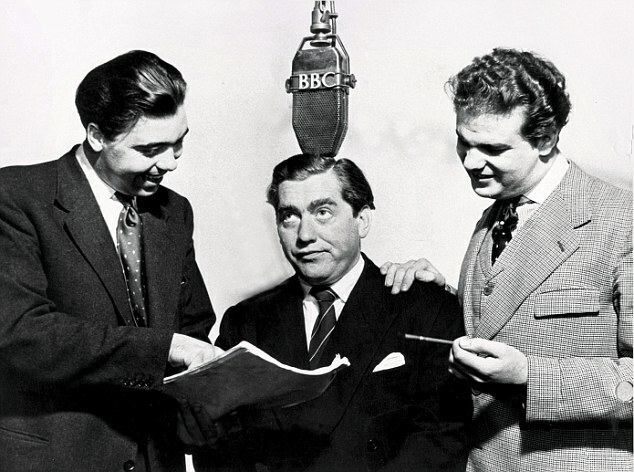 Best known for Hancock’s Half Hour and Steptoe & Son, Galton and Simpson are arguably the greatest comedy writing duo of the twentieth century. The aged Alan Simpson, is also the President of Hampton and Richmond Borough Football Club. Dulwich Hamlet beat them in the FA Cup today and have a further two encounters in the Ryman Premier League in the next six weeks. 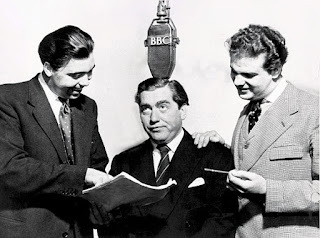 Alan Simpson, Tony Hancock and Ray Galton. I spotted Mr Simpson at half time and had a very brief chat with him. I read somewhere that he played for Dulwich Hamlet after the war, and I asked him if this was the case. Sort of, it was the Hamlet’s Junior team, the under 18s, that he turned out for. And it was only actually one match. “It was Boxing Day morning 1946.” He told me. “We lost the game 8-3 and I was in goal.” His services were not required after that. Perhaps it was for the best. Whilst recovering from tuberculosis in a Surrey sanatorium a few months later, he met Ray Galton, another inmate at the hospital, and the pair hit it off instantly. The staff even allowed them to perform some of their early comedy ideas on the hospital radio station. And thus began a lengthy writing partnership that brought them great acclaim. At sixteen I was studying my CSEs at Peckham Manor School. Among our English reading material – Catcher in the Rye by JD Salinger, Of Mice And Men by John Steinbeck, etc., – was Galton and Simpson’s Steptoe & Son television scripts. Being something of a mimic, I was always asked by our teacher to read aloud one of the parts during our English lessons. I could ‘do’ both characters, Harold and his ‘dirty old man’ Albert. One time I was called upon to read both parts. Around the same time I had a number of friends who were hooked on Tony Hancock. We used to sit in cars and rooms laughing our heads off, and pass around cassettes and LPs of these famous radio and television shows from the fifties starring the man himself alongside Sid James, Kenneth Williams, Hattie Jacques and Bill Kerr. Even today, forty years later, we still find ourselves quoting lines from Hancock’s Half Hour.